Jon Hollis of the Capital Regiment sent in this one. 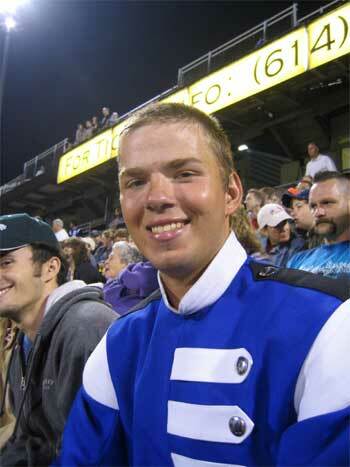 "I submitted a picture and story of how I dreamed of marching corps, which was published under "Living the dream (an essay)." Here is my dream realized: A Shot of me in the stands at the 2004 Artistry in Motion show, as taken by my brother. I am proudly sporting the royal blue of my beloved corps and second family, Capital Regiment. That night's show was one for the ages, as the corps was on fire for our hometown crowd and we broke 80 for the first time that season." Thanks Jon!